The name of Lan Tianyu was first seen in the "Han Geography" and Meiyu was produced in "Lingtian Mountain in North Beijing (now North Xi'an)." Later, ancient books such as Later Han Book Wai Qi Chuan, Zhang Heng's Xijing Fu, Guangya, Shui Jing Zhu, and Yuan He Jun Zhi Zhi both contained Lamian jade. During the Ming Wanli period, Song Yingxing stated in the book â€œHeavenly Creationâ€: â€œThe so-called Lam Tin, that is, the Congling Ridge (Kunlun Mountain) has an alias of jade, and later mistakenly thought that the Lantian of Xiâ€™an.â€ Since then, it has caused disputes among the later generations. The said that Lam Tin does not produce jade at all, and some say that even if jade is produced, it may be Laiyu (yellowish green with colored leaves). In recent years, Shaanxi geologists discovered serpentinized marble and jade material in Lam Tin, which is believed to be the ancient record of Lan Tianyu (People's Daily, November 23, 1978). This discovery not only attracted the attention of the geological community in search of raw material for pearls, but also attracted the interest of archaeologists. In 1982, the geological museum of the Ministry of Geology and Minerals exhibited the above-mentioned original stone of Lantian jade. When the serpentine is strong, the local part has become the same as jade. Judging from the appearance, the jade has a non-uniform tone such as yellow and light green, and is accompanied by light white marble. 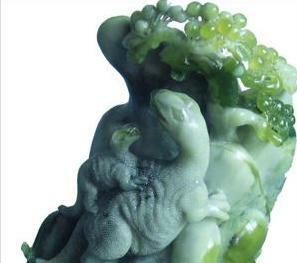 Although this kind of jade is not very beautiful, but because Lam Tin is located near the ancient city of Xi'an, the hardness of jade is about 4 and it is easy to process, so the ancients may use it as an ornament. There are two pieces of jade in the Han Dynasty that resemble today's Lantian jade, one is a large jade piece unearthed near the Mausoleum of Shaanxi Wudi Emperor inlaid on the ancient tomb door, and the other is the Han Dynasty jade pedestal hidden in the Palace Museum. Judging from the jade and color of these two jades, many geologists think that they are similar to the modern Lantian jade. However, if it is really an ancient Lantian jade, it needs further examination.